Full Text Finder is a service you would use if you want to know if a magazine or journal article can be found in its entirety (full text) through our library’s collection. Many of these journals also allow you to create an RSS Feed and/or Create an Alert, so you can keep up with the latest articles in your discipline. Find Full Text Finder on the Article Databases webpage, by choosing “F” on the alphabetical list. It is also located under the Research drop down box on our home page under Find a Specific Journal. To use Full Text Finder, simply type in the title you want to search. Research Guides are online guides that provide quick access to databases, websites, books, ebooks and other resources on a given topic or for a specific class or assignment. Research Guides are a great starting point for your research, and have been created in consultation with your instructor. It does what it says: it “guides your research” to the best sources to begin with on that topic. Guides are set up with tabs that lead you to subtopics within that guide, such as article databases, websites, books/ ebooks, citing, choosing a topic, search strategies, and more. To get started, click on Research Guides on the main library webpage. Find your topic on the alphabetical list. Then explore the guides either by the subject area or the guide created for your particular class. It’s that easy! 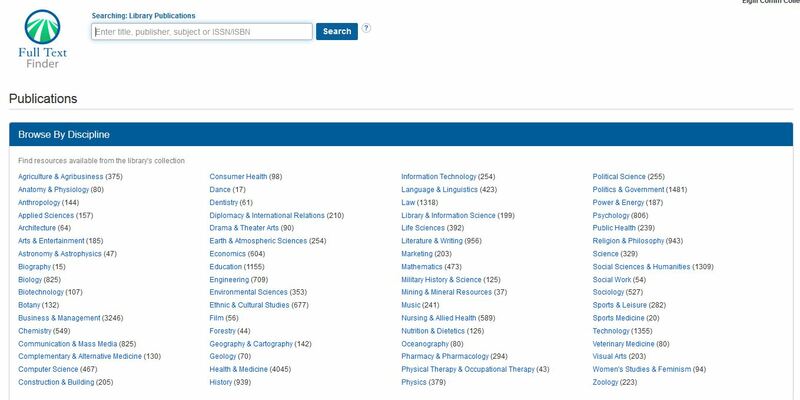 From EBSCO: CINAHL Plus with Full Text covers a wide range of topics including nursing, biomedicine, health sciences librarianship, alternative/complementary medicine, consumer health and 17 allied health disciplines. It includes full text of over 770 journals in the nursing and health sciences discipline. CINAHL can be accessed through our Article Databases list or through EBSCO. For questions about using this database or researching, please contact the librarians in Building C or ask your instructor. Under the category “Current Events & Controversial Issues,” the library has created this Research Guide on “Undocumented Students and DACA” or “Deferred Action for Childhood Arrivals”. The guide includes a four minute video (second tab) about this immigration program created by Obama in 2012, as well as information to keep informed on current government policies that appear to be threatening the status of the program. Tabs include information and articles specific to DACA, links to local and national legal resources (including Centro de Informatcion in Elgin), links to financial and educational resources, a Google news feed on DACA, and how to contact ECC’s Wellness Services department if you need help. If you know of other related resources send us your suggestions and we will consider adding them to this informative resource. Keeping your Future Bright at the ECC Library! We are going to make your life easier by providing these Top 5 Tips to smarter Google Searching. Feel free to share your own tips in the comments! For example: “higher education” instead of higher education. This will narrow your results and allow the computer to search for the phrase. AND is the default for Google searching, so when you add terms to your search, it will keep narrowing your focus. OR is a way to expand your search if you keep hitting dead ends. For example: higher education OR college OR university. Good for synonymous terms. anxiety site:Mayo Clinic to just retrieve results from the Mayo Clinic website. If you’re unsure where to start this can be a good starting point that directs you to scholarly resources. Sometimes you will get full text available through the library on this site as well. Not everything will be in full text. This tool is also great when you are looking for a specific source as it has a field for “all these words” as well as a field for “this exact word or phrase”.